Stage Roof Systems, from local festivals and charity events to the big summer music stages and drama stage productions, a good quality weatherproof stage roof system can literally save an event from total washout, or from the blazing sun. 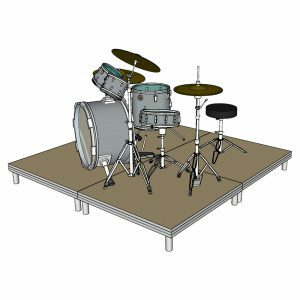 A stage roof provides protection for audio and lighting equipment, gives wind proofing which aids in both performer comfort and helps the onstage acoustics, and provides a strong focal point visually in an open area. With increased demand for Stage Roofs through the rise in live music and other outdoor gatherings, Truss and Stage Roof manufacturers have added smaller roof systems to their ranges, though these are still ‘touring grade’ packages and come at a premium cost. Whilst more than justified for the pro user, rental company or travelling outfit, the costs are often prohibitive for the more local area user and above the budgets for most small events. This traditionally left many outdoor events to go ahead without any form of roofing structure in place, and risk being called off. 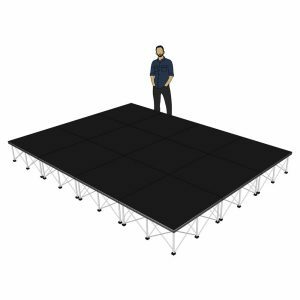 Our range of affordable Stage Roofs aim to tackle the steep costs associated with structures of this type, and make them an affordable option for any sized event production, personal buyer or rental company. Our Events Stage packages are the perfect solution for the medium to large sized Stage Roof buyer, offering a large selection of designs, shapes and sizes from our Alustage range or our own SC Pro systems. They utilise different types of Truss depending on their design and capabilities which helps to lower the cost significantly and makes transportation an easier prospect on smaller systems. A stage roof structure provides shelter for performers and electrical equipment from wind, rain, and the other extreme of baking hot sunshine. 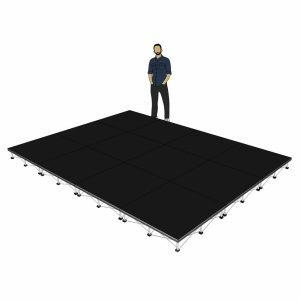 When used with its provided sidewalls, it also provides much better on stage acoustics and allows the use of lighting effects during the day. For our own SC Pro Roof Systems we specified an internal frame height which gives a 2.2m (7.3 ft) head clearance to the front horizontal beam when standing on our stage decks fitted with the standard 400mm legs. 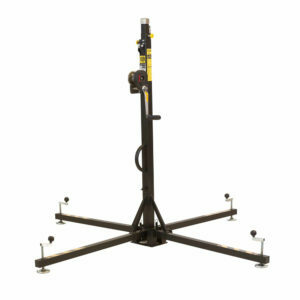 This gives you a nice commanding performance height without feeling claustrophobic under the canopy. We got together with our UK manufacturer and have produced these fantastic roof systems, which offer exceptional value and have been created to be versatile enough for multiple uses, with or without stage decks. The standard size frame available is 6m wide x 4m deep, with a floor to peak height of 4.1m. Each roof system is supplied as a complete solution with waterproof heavy grade PVC roof canopy and side walls. Manufactured from custom aluminium ladder truss with a 50mm size pipe, the frame is light enough to be easily managed by a few people. The framework can be supplied with standard peaked roof structure or flat arched canopy if required. The roof systems are very easy to assemble and can be erected quickly and safely with minimal tools. 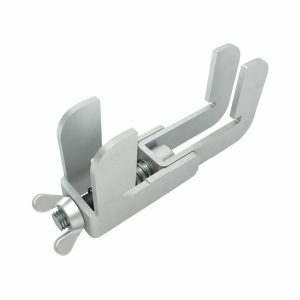 The canopy and walls are affixed to the framework using a simple and secure bungee system and the frame itself is a nut and bolt fixing. We offer standard packages with or without stage panels to suit all needs. Everything is customisable as these roof systems are built to your exact requirements and order specifics. For the professional user, we supply the full roof systems from the Alustage and Milos ranges. These are serious systems, available in a wide range of styles and dimensions to suit both transportable use and permanent installation. 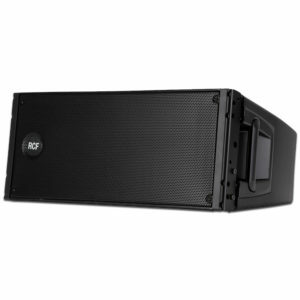 They have been designed for a lifetime of heavy use and have the load bearing capability to handle the large light and sound rigs of big stage productions . 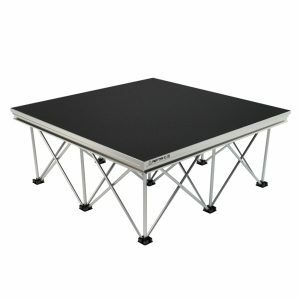 Constructed from a heavier duty grade of Truss pipework, these touring grade structures are designed for heavy usage and to take the abuse that a life on the road will present to them, along with the loading requirements of a large professional lighting rig and display systems. The heavy engineering involved reflects in their significant cost when compared to a more general use roof package, and they cannot really be compared other than in looks. 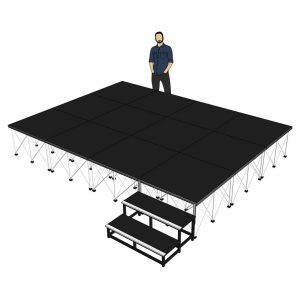 Larger systems can be specified with ‘wings’, which extend the truss framework outwards from the main roof to allow for the flying of Line Array sound systems and projection or led display screens. We offer both medium to large sized roof systems from Alustage and Milos, all available in flat, gabled and arched designs with or without side wings or Line Array Lifting Towers. For the extra large roof systems it falls to Milos as the industry leader in gigantic outdoor structures, with their systems being seen at the famous Glastonbury and Reading festivals. Through our SC Projects wing we are able to offer bespoke design and manufacturing options to our customers on Stage Roof Systems and Trussing packages. Should you either not be able to find a suitable Roof Package from our available range, or you have very specific requirements for your project or build then we are here to help. 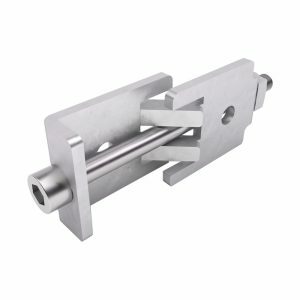 Using 3D Cad design software to visualise a design before manufacture allows us to ensure that you are happy with how the finished build will look, and helps our fabricators avoid any issues in the design itself before any physical work is carried out. All of our Custom Roof Builds and Custom Truss are manufactured here in the UK and meet all the very latest requirements for quality and safety, with full stress loading and testing certification available on request. Shown here in two short time-lapse videos, the construction process from start to finish of an Alustage 10 metre x 8 metre Stage Roof System to show whats involved and to give an idea of actual real world size.